The Michigan AG said Shirvell "engaged in borderline stalking" and "violated office policies"
(CNN) -- An assistant attorney general in Michigan is out of a job, fired after targeting an openly gay University of Michigan student leader online and in person -- then lying about his actions to investigators -- state Attorney General Mike Cox said Monday. Andrew Shirvell "repeatedly violated office policies, engaged in borderline stalking behavior and inappropriately used state resources," Cox said. The lawyer for Chris Armstrong, the university's student body president, lauded the decision by Cox to axe Shirvell. "It's inexplicable -- he knows nothing about Chris," attorney Deborah Gordon said on CNN's "AC 360" about Shirvell, who claimed that Armstrong was a "racist, elitist liar" and "privileged pervert." "We're very gratified that justice was done ... and, for the time, Shirvell is going to be held responsible," Gordon said. Shirvell's lawyer, Philip J. Thomas, acknowledged his client's termination to CNN but did not comment further. He told the Detroit Free Press that his client was "devastated" by Cox's announcement, claiming that Shirvell's bosses gave him positive reviews and knew of his activities outside work. "This smells political to me," Thomas told the newspaper. "There's been a tremendous piling-on against Andrew. The liberal media started this tempest in a teapot." Gordon responded by telling CNN's Anderson Cooper on Monday night that she felt it was "pathetic and lame for (Shirvell) to be whining about being bullied." In late September, Cox defended Shirvell's authoring of a blog titled "Chris Armstrong Watch" that railed against the college senior and sociology major. "Here in America, we have this thing called the First Amendment, which allows people to express what they think and engage in political and social speech," Cox told CNN. "He's clearly a bully ... but is that protected under the First Amendment of the United States Constitution? Yes." But in Monday's announcement, Cox said he concluded that Shirvell's dismissal was warranted due to actions "unbecoming a state employee" that went beyond the blog. Cox said he wasn't firing Shirvell for "exercising ... First Amendment rights, (however) unpopular (the) positions might be," but for persistent and personal harassment. According to Cox, Shirvell showed up at Armstrong's home three times -- including once at 1:30 a.m. Cox said that this early morning visit, especially, showed that Shirvell was intent on harassing Armstrong, not just exercising his right to free speech. -- Calling the office of U.S. House Speaker Nancy Pelosi, where Armstrong worked, "in an attempt to slander Armstrong" and get him fired. -- Trying to "out" Armstrong's friends -- some of whom were not gay -- as homosexual. -- Harassing Armstrong's friends while out socializing in Ann Arbor, the home of the University of Michigan. Cox had originally defended Shirvell in part because he believed his blog was being done when he wasn't at work. But he said Monday that Shirvell had, in fact, posted online "attacks" on Armstrong and called Pelosi's office while he was on the job as an assistant attorney general. In his statement, Cox also said that Shirvell lied to investigators "on several occasions during his displinary hearing." After his blog garnered national media attention, Shirvell placed it behind a privacy firewall, making it available only to invited readers. In early October, he took a voluntary leave of absence from his job. Around that time, Shirvell, a graduate of the University of Michigan, was barred from the Ann Arbor campus. Shirvell defended his postings on "AC 360" on September 28, acknowledging that he protested outside Armstrong's house and called him "Satan's representative on the student assembly." "I'm a Christian citizen exercising my First Amendment rights," Shirvell told Cooper. "I have no problem with the fact that Chris is a homosexual. I have a problem with the fact that he's advancing a radical homosexual agenda." Armstrong, who said he has never spoken with Shirvell, told CNN days later that his principal issues as the school's student body president was longer cafeteria hours, gender-neutral housing and lower tuition costs. 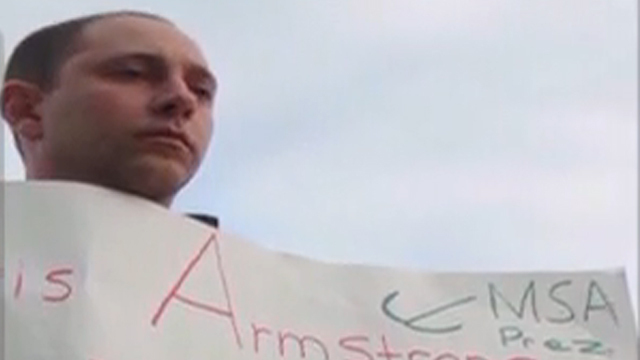 "The things that are said about me are not my issues," Armstrong said. Gordon said that she and her client aren't done going after Shirvell. That includes trying to have him disbarred as a licensed attorney in Michigan. She said investigators' finding that Shirvell lied to the attorney general's office is central to their case. "This man is a loose cannon with a law license," said Gordon. CNN's Anna Gonzalez contributed to this report.